I would have never guessed that Morocco saw much snow but boy was I wrong. And it makes sense too. Of course, with the grand Atlas Mountains covering the country, there’s bound to be snow in Morocco. But I just didn’t believe it until I saw it! And I did. I saw a lot of it, way more than I thought! Especially getting to Toubkal National Park, even in April, there was snow. 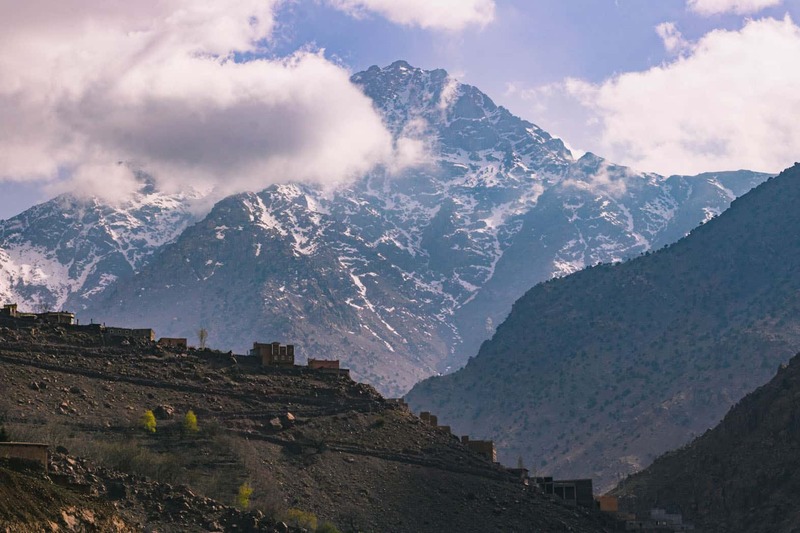 Toubkal National Park is home to the country’s (and North Africa’s) highest peak, Jebel Toubkal. And the area is drop dead gorgeous. A complete stark contrast to what you would think Morocco looks like, well, at least if you’re as silly and naive as me! 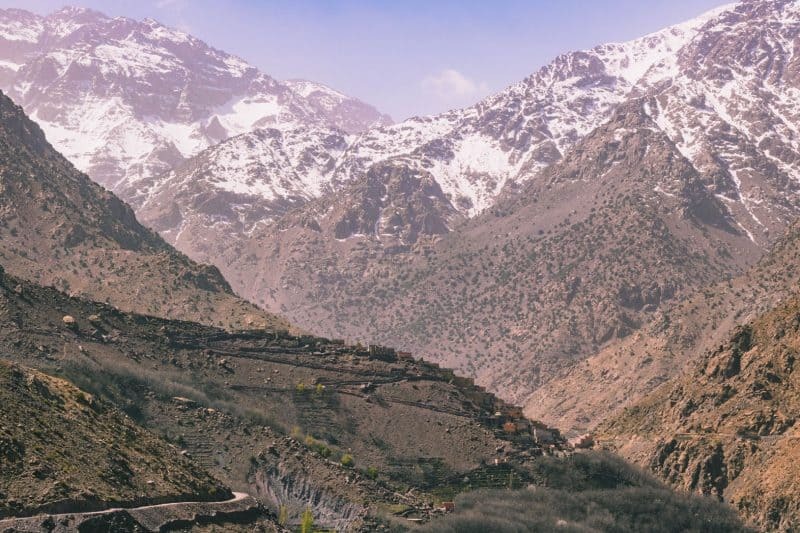 I didn’t picture lush jungle, running rivers, a waterfall, and massive mountains surrounding me sprinkled with snow and ice before coming to Morocco but it’s exactly what I got at Toubkal National Park. We came here on a complete whim while road tripping Morocco and didn’t expect this level of beauty, nor did we expect the intensity of the hike. We didn’t come here to hike but kinda wanted to by the time we actually arrived! Renting all the gear, including crampons (!) 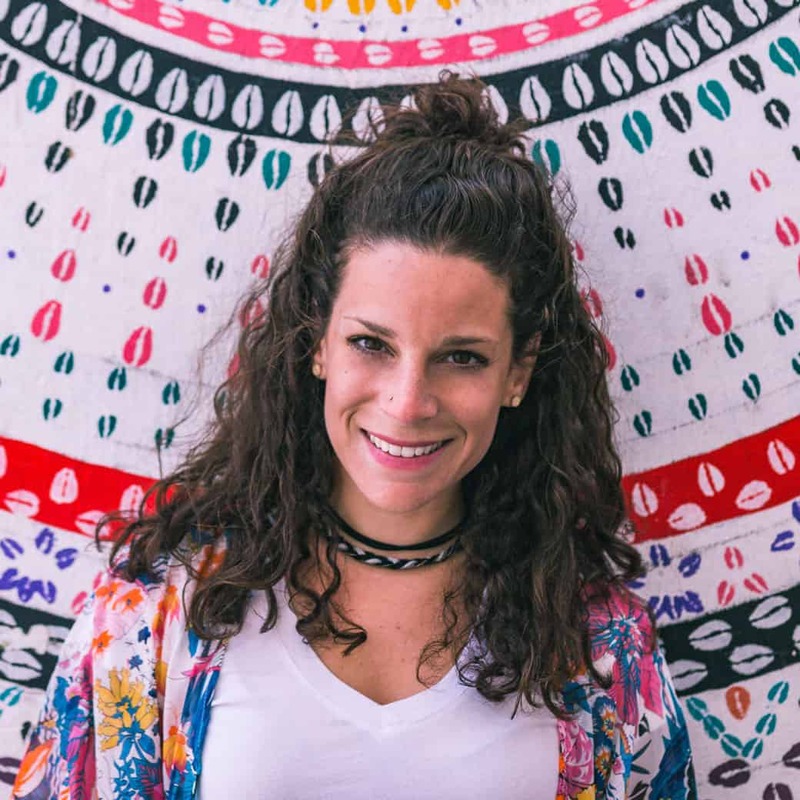 would have set us back around $200 or so bucks, which isn’t too bad considering you get a guided hike through Toubkal National Park for two days. But it wasn’t in the card for us this time. This time, we decided to check out the town and the surrounding trails for a chill day trek while admiring the mountains towering above us. 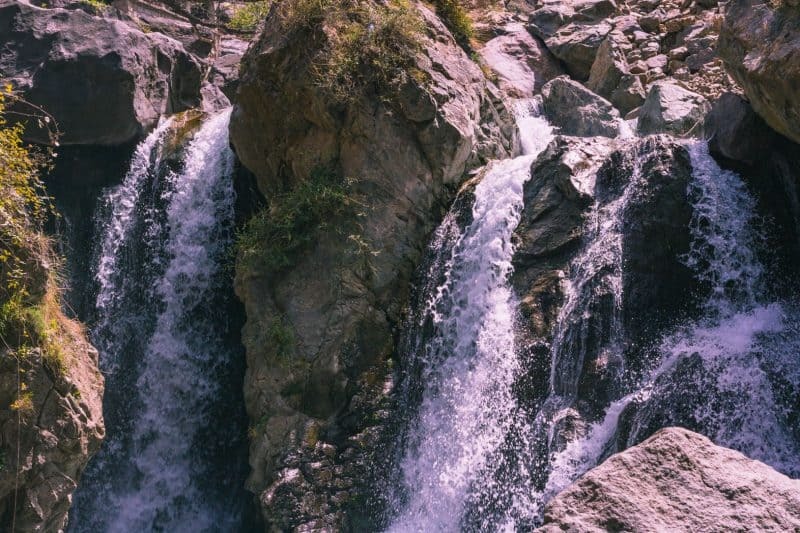 Here’s the short day trip hike around Imlil that we did with Maps.me coordinates to help you along the way. Imlil’s waterfall just a small trek outside of Imlil. For an easy, free, and beautiful walking trail around Imlil, I’d highly recommend downloading Maps.me. I’m not sure how you’d do this trail without it. The below coordinates that you’ll find show up on Google Maps but Maps.me actually show you the trails. We stayed in Ait Souka, just outside of Imlil which has beautiful views of the surrounding mountains. We started our trail from there and headed to the waterfall. When you’re using Maps.me, you’ll see the waterfall on the map. Just map your walking route to that waterfall, it’s rather easy. Along the way, you’ll find small shops, donkeys strolling along (watch out for poop! ), and even a little cafe. While the waterfall is nothing super spectacular, considering we had just spent days road tripping alongside dried up river beds and hiking sand dunes, it was awesome to actually see full running water again! Trails around Toubkal National Park. Of course, like many of these spots in Morocco, you’ll also find a fresh OJ stand right at the bottom of the waterfall with a little hang out spot too. To continue along the trail we took, walk to the cafe just above the waterfall and follow it up a hill and towards the town you see above you. When you get to the road, continue going up. There should be a small sign across the road that says “Gite Atlas Toubkal,”follow that and continue walking up a hill. We walked through villages alongside the mountains until we saw the radio towers far ahead of us. Our guesthouse was at the bottom of those so we decided to head there but first, made a detour (31°07′35.35″N 07°54′55.78″W). I found the perfect rock to just chill on and take some photos. We spent a long while at this rock! It was a good find! The rest of our walk was up and down the mountain trails, sometimes having to cross a river (31°07′40.29″N 07°54′41.8″W) and even having to hug the side of the mountain a bit as the pathways got a bit narrow! If you’re reading this and it’s been a few months since publication, let me know if there’s a cute beverage stand here (31°07′45.55″N 07°54′45.58″W). When we walked passed this spot, we met some super friendly and nice locals building a drink stand for hikers. Future hikers will be having some EPIC views while sipping their tea soon! 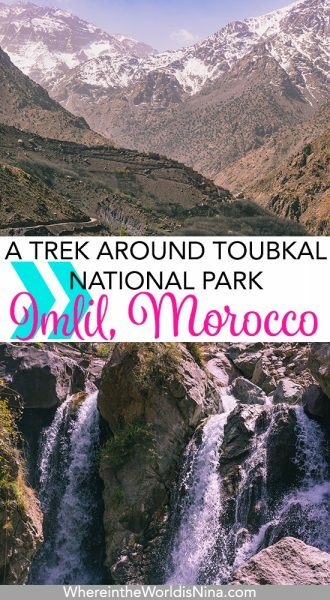 While this hike is not challenging, nor something you’ll go home raving about, it was a really nice day of hiking around Imlil if you came not planning on hiking or wanting to spend money on the two-day Toubkal trek! There are also some radio towers on a hill here (31°08′24.36″N 07°54′50.35″W). If you climb up here, you’ll find some nice views of Imlil and the mountains. This is quite a short hike, so if you’re super low on time, you can just clamber up here and call it a day! 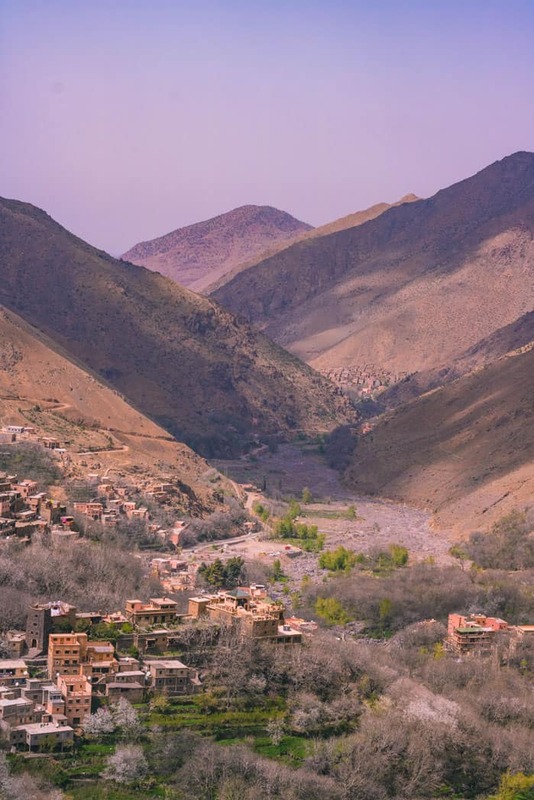 If you’re anything like us and are totally unprepared, you can totally grab yourself a day trip instead or, if you’re ready for the challenge, take on the Atlas Mountain trekking tour! 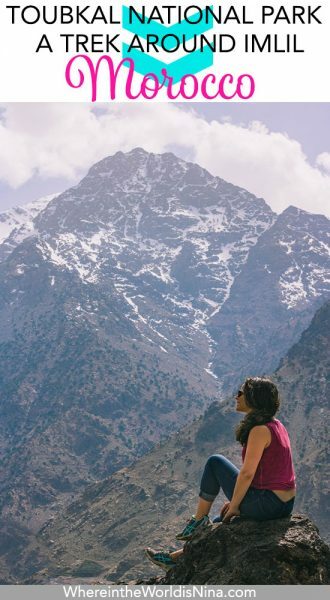 Marrakesh is actually not that far, so book yourself an Atlas Mountain day trip over to Imlil so you can get a taste of the mountain life. From Marrakesh, you can see the Atlas mountains! Which is a total tease, so a day trip is ideal if you’re low on time but want to get out of the chaotic city for a bit. 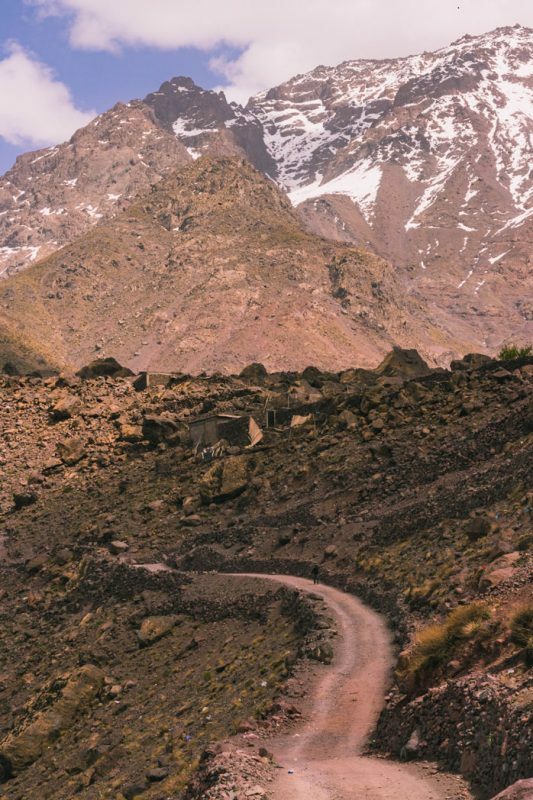 Actually wanting to hike Toubkal? You can do it! But you do need a tour. 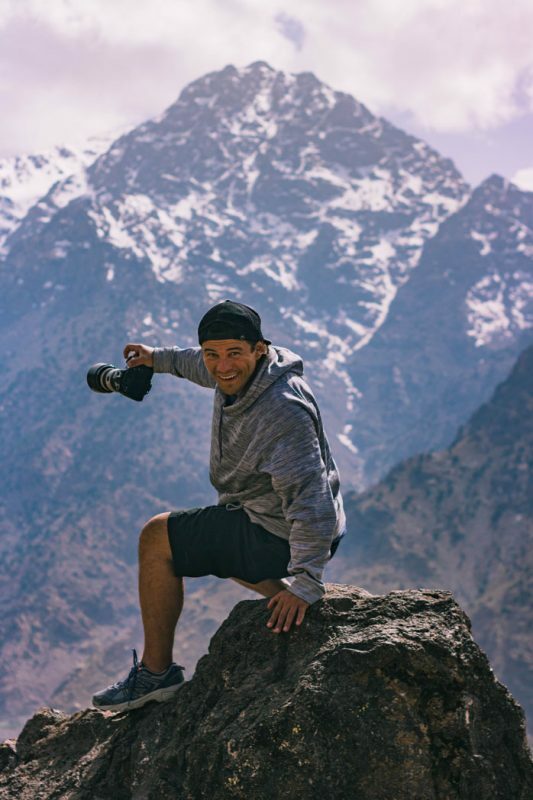 This Toubkal hiking tour is highly recommended and having it booked ahead of time takes one more thing off your list while you’re trying to enjoy your stay in Morocco. Not to mention, you won’t have to deal with pushy people trying to sell you a tour once you arrive. Click here to book a Toubkal trek! You don’t want to deal with booking it there. People can be a bit intense when they want you to buy their tours. Just book a guide prior to going and you can be all sorted once you get there! After walking around asking for prices this tour is the same price you’d get if you booked it in Imlil! Water, lots and lot of water! Despite it still being a little bit chilly in April, the sun was blaring and you still get very thirsty. Good shoes. Don’t try this with flip-flops. Trust me, I’m a flip-flop queen and wear them everywhere, but I wore my running shoes and I’m really glad I did. Maps.me. Seriously. Just download it, and make sure to download the maps while on wifi so you can use it offline. You won’t be able to get around these trails without it, in fact, it helps for all of Morocco! You can stay in Imlil itself or stay in Ait Souka. It’s very easy to walk between the two, and Ait Souka is a bit quieter and has less bustle than Imlil. Imlil Refuge is a good budget choice, for a bit more value you can stay in Kasbah Imlil or Riad Jnane Imlil. Are you interested in visiting Imlil? 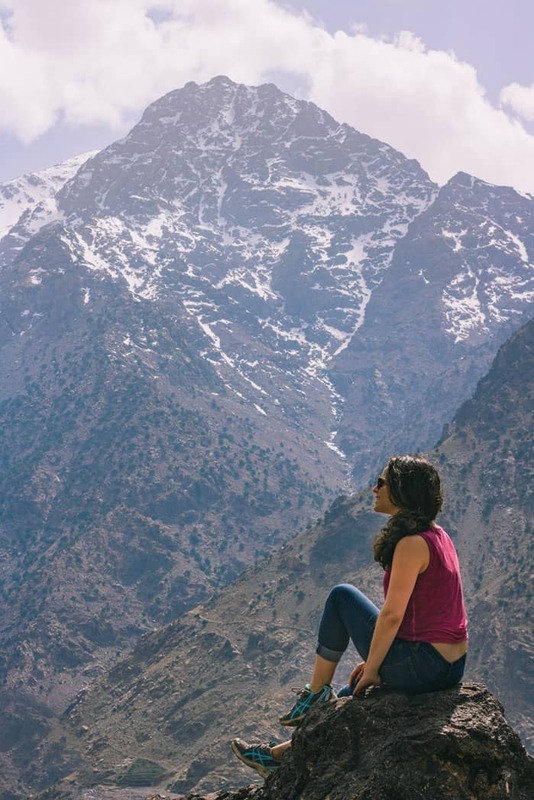 Let me know what hike you want to experience around Toubkal National Park in the comments. Don’t lose this! Click the picture to pin it for later.